The Agormanya Area of The Church of Pentecost, led by Apostle James Gabriel Quardson, has organised a residential retreat for ministers and their wives in the Area. The four-day retreat took place at the Gift Guest Hotel in Koforidua from November 26 to 29, 2018. The ministers and their wives were taken through sessions of teachings, prayer and discussion of the Church’s Vision 2023 document. Referencing John 2:13-22, the Area Head revealed that Jesus could not stand to watch His Father’s house to be turned into a marketplace, because the zeal of the Lord had consumed Him. “Possessing the Nations calls for illimitable devotion and commitment of time, resources and energy,” he said, adding that ministers can work towards the achievement of the Vision 2023 when they are being consumed by the zeal of the Lord. He explained that the zeal of the Lord is manifested by the supernatural works of the Holy Spirit and enables believers to acknowledge the sovereignty of the Lord over human life. The Area Head indicated that Christian leaders who are consumed by the zeal of the Lord focus on making people right with God and prepare them to inherit the Kingdom of Heaven; continuously dream about the ministry and give birth to new visions every day wherever they find themselves; are always on the move with the Lord just as the Apostle Paul described in 2 Corinthians 2:26-31, and they stand in the gap between God and His people. According to him, one of the reasons for the call into the full-time pastoral ministry is for pastors to stand as intercessors between God and the people they pastor, even as the church on a whole stand in the gap between God and the nations. 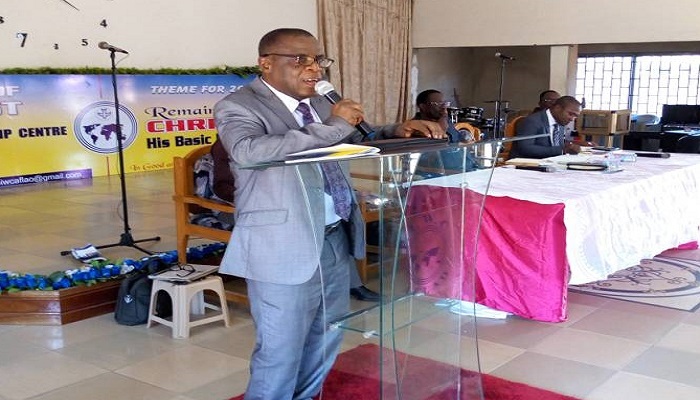 “Possessing the Nations is not a vision for only ministers in the external mission fields of The Church of Pentecost but it is for the members in entirety,” he stressed. Apostle Quardson cautioned that zeal without knowledge is catastrophic (Romans 10:2). He therefore entreated ministers and their wives to add to their zeal knowledge by constantly studying the Bible and other helpful literatures.